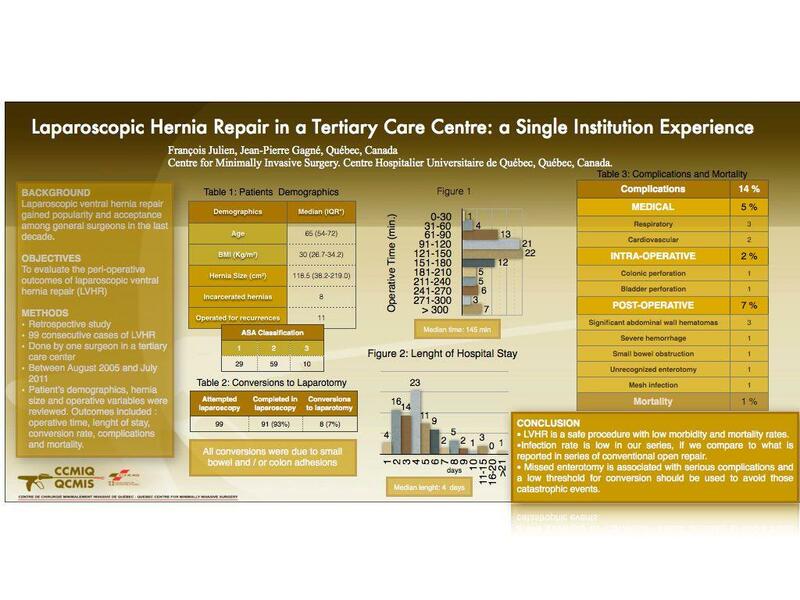 This study evaluates the peri-operative outcomes of laparoscopic ventral hernia repair (LVHR) done by one surgeon in a tertiary care centre over a six-year period. This is a retrospective study of 99 consecutive cases of LVHR performed between August 2005 and July 2011. Data included patients’ demographics, BMI, ASA classification, hernia size, operative time, length of stay, conversion and complication rates. Of the 99 patients, 46 were men. Median age was 65 (28-88). Median BMI was 30 (22-46). Eleven patients had recurrent hernias while 8 presented with incarceration. Most patients (69/99) were classified as moderate surgical risk according to ASA classification (category2-3). Median hernia size was 120 cms2 (9-560). Median operative time was 150 minutes (30-720). Median hospital stay was 4 days (1-210). Conversion rate was 8%. Most for conversions were due to adhesions (7/8). In that subgroup of 8 patients, median operative time was 260 (180-720) minutes and median hospital stay 6 days. Complications occurred in 22 patients. There was one death. There was no early post-operative infection. There were two enterotomies, one of which was recognized one week post-operatively, resulting in peritonitis, stoma creation and a prolonged hospital stay. LVHR can be considered as a safe procedure providing excellent immediate results and short hospital stay; the infection rate in this study is much lower than most reported series of open approach. However, the most feared complication is a missed enterotomy; thus, a low conversion threshold might be the best way to avoid such catastrophic events.